High sound quality Bluetooth earphone: Bluetooth V4.2 CSR 64110 is adopted, hands-free calling is possible without taking out a cellular phone with built-in microphone. Listening with calm sound quality is hard to get tired. CVC 6.0 noise cancellation function is adopted, noise around the call is blocked, and more clear speech sound quality is realized. Four types of profiles such as A2DP, AVRCP, HFP, and HSP can be supported. NOTE: while using, all TWS earbuds may lose connection transiently. Press the earbud 5~7 seconds(no release) until the earbud flash red and blue light in turn, and you will hear "pairing", then turn on your bluetooth device, search for "X3T" to connect. 1,Press "L" earbud for 3~5 seconds until it flash red light, then press "R" earbud for 5~7 seconds(no release) until it flash blue and red light in turn, "L" and "R" earbuds are pairing automatically. 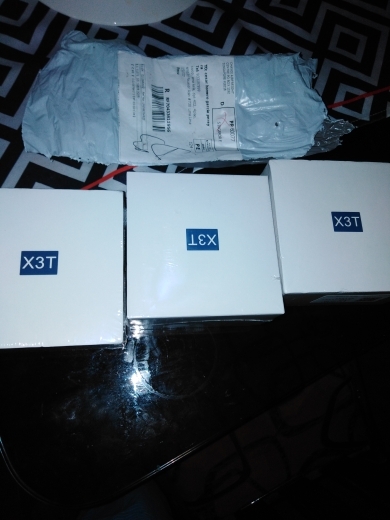 2,Turn on your bluetooth device, search for "X3T" to connect.